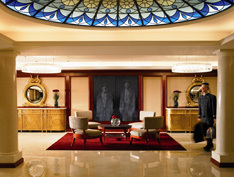 The Shelbourne Hotel reopened in March 2007 after an extensive 2-year renovation, is Dublin, Ireland's largest five-star luxury hotel with 265 guestrooms including 19 suites, and is centrally located across from St. Stephen's Green. Originally built in 1824, The Shelbourne Hotel has kept the feel of the architecture with soaring ceilings with a bit of modern enhancement including the 24-carat golf leaf ceiling in the lobby and mezzanine. Past guests of The Shelbourne Hotel will be pleased to know that although the hotel has made some changes, the Lord Mayor's Lounge and The Horsehoe Bar remain and have been lovingly restored. Edward F. Nesta and I stayed at The Shelbourne Hotel in September 2007, and during our stay we had coffee in the Lord Mayor's Lounge where ornate details included intricate moldings and crystal chandeliers setting the ambience of the room. 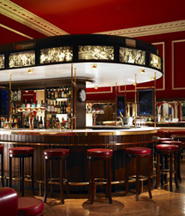 We also had drinks in the Number 27 Bar and Lounge, new since the renovation, and has already established itself as the spot to be seen, as fashionable Dubliners came in to indulge in a glass or two of wine or their favorite cocktails. 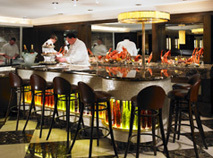 The hotel has a new restaurant, The Saddle Room, where Executive Head Chef John Mooney creates modern cuisine with a steak and seafood theme, and also features an oyster bar where guests can enjoy Clare Atlantic Oysters, Carlingford Oysters, Galway Oysters, French Claire Oysters, lobsters, and prawns. We enjoyed dinner at The Saddle Room where a few of our selections included Pan Seared Foie Gras, Caramelized with Drunken Cherries and Toasted Almonds; Crab Cakes, Roasted Pepper, Basil and Lemon Mustard Aioli; and Roast Rack of Wicklow Lamb, Potato Gratin and a Mustard Crust. 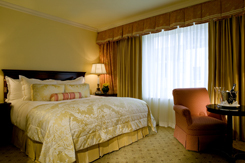 Our guestroom featured a king bed with wood headboard that was sumptuously dressed with a cream and yellow floral pattern bedspread, decorative pillows, and Italian linens. Nightstands on either side of the bed held tall lamps with cream lampshades, and paintings graced the walls. Rust and yellow striped floor to ceiling and ivory sheer window treatments framed the wide window. A mirror hung over the desk set against the wall opposite the bed, and a rust and yellow striped chair flanked a small round wood table that held a fruit plate, chocolates, and a selection of magazines. Amenities included a mini-bar, Philips CD/Clock Radio, Philips HD television, Internet access via a cable for a fee, and complimentary newspapers delivered to the room. The closets held robes and slippers, an umbrella, iron and ironing board, and a safe. The marble bathroom featured a combination shower/tub, double sinks, vanity mirror, hairdryer, and The White Company amenities. The hotel is filled with lovely surprises, including the attractive stained glass ceiling in the reception and the daily treats to satisfy the sweet tooth. During our stay we sampled their delicious Lemon Cake and also Milk Chocolate Brownies with Pistachio Nuts, and were pleased that the hotel had also included the recipes so that guests could take home a taste of The Shelbourne Hotel. To leave you with a sweet taste of The Shelbourne Hotel, I have included the recipe for Milk Chocolate Brownies with Pistachio Nuts. Method: Mix together sugar and eggs. Melt the milk chocolate and the butter. Fold sugar and eggs into the chocolate mixture. Add in nuts and plain flour. Bake in a pan at 160° C (320 F°) for 20 minutes. Read other articles on The Shelbourne in the Restaurants and Chefs' Recipes sections where Executive Head Chef John Mooney shares a delectable three-course menu. Please read other articles on Ireland in the Destinations section including: County Cork and County Wexford, Ireland and County Clare and County Kerry, Ireland, Hotels and Resorts, Restaurants, Chefs' Recipes, Spas, Liquor Cabinet: Celtic Crossing Liqueur, Boru Vodka, Knappogue Castle Irish Whiskey, Fashion, and Adventures sections. For information on Ireland, please visit the website: Discover Ireland, www.DiscoverIreland.com or call them at +1-800-223-6470. For driving directions in Ireland, visit www.AAIreland.com. For information on Aer Lingus, please visit the website: Aer Lingus, www.AerLingus.com. © February 2008. Luxury Experience. www.LuxuryExperience.com All rights reserved.